We recently ran a contest asking customers to send us pictures of their beverage refrigerators. The response was overwhelming! You showed us your wonderfully remodeled kitchen and bar areas as well as your creativity by using a beverage refrigerator to store film. Cory Verellen, owner of Rare Medium camera store in Seattle, WA. Cory uses two EdgeStar 84 Can Extreme Cool Beverage Cooler and two EdgeStar 103 Can and 5 Bottle Extreme Cool Beverage Cooler to store and protect film. He’s had these beverage refrigerators in his store for about 3 years and couldn’t be happier. He started his research by looking for commercial beverage refrigerators, but realized they were too expensive. He needed multiple units that were affordable and looked sleek enough for a business environment. A quick online search led him to our site where he found high quality units at reasonable prices. Cory’s favorite feature is the glass door which helps customers browse the merchandise. The customers often comment on the great lighting. Our units come with LED lighting but he added additional LED lighting strips to further display the film inside. Cory has 4 total in his store but is looking to add another one so he can keep larger stock levels. If you’re in the Seattle area, be sure to stop by Rare Medium to browse around and check out how great the beverage refrigerators look. Julie Barden remodeled her kitchen and knew a beverage refrigerator would fit in perfectly. Not only would it look great but she was excited to have more room in her main refrigerator. 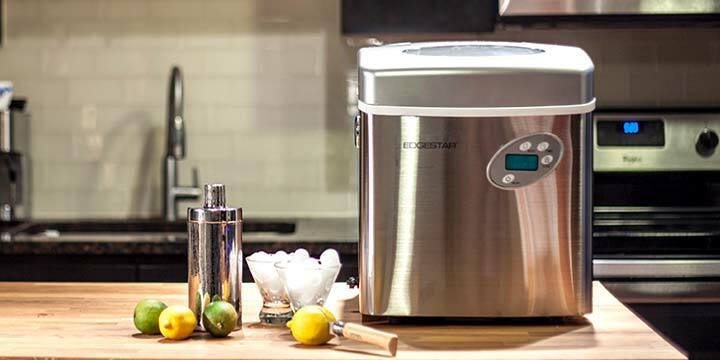 After researching different websites and reading product reviews, she found herself on CompactAppliance.com, where she purchased the EdgeStar 103 Can and 5 Bottle Ultra Low Temperature Beverage Cooler based on its good reviews and great price. She uses it for soda, beer, and wine. 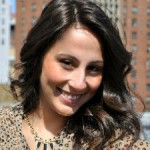 Julie’s favorite feature is the blue LED light that softly illuminates the kitchen at night. She also loves how quiet and spacious the beverage refrigerator is. Many of her friends and family comment on how wonderful it is and are thinking of purchasing one for themselves! Even Julie is considering buying another one for her game room. 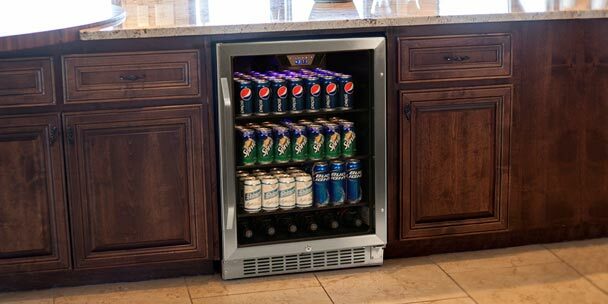 After seeing how beautiful Julie’s newly remodeled kitchen turned out, we’re sure a beverage refrigerator would look great in her game room as well. Justin Barlow customized his beverage refrigerator, the EdgeStar 103 Can and 5 Bottle Extreme Cool Beverage Cooler. Understanding that it was a free standing unit and not meant to be built into cabinetry, he got creative. He purchased a cabinet and cut the cabinet so it was the same height as the beverage cooler. Justin left open space on the sides of the unit and installed an auxiliary wall fan behind to ensure proper cooling, then laid glass across the top for a cohesive look. Guests always comments on how wonderfully he integrated it into the décor. Justin wanted to free up space and keep drinks out of his primary refrigerator. Originally he used a mini fridge in the garage but loved the idea of creating a bar area in his living room. So he shopped around and compared different pricing when he landed on CompactAppliance.com. Based on user reviews, he found the perfect beverage refrigerator to hold both cans and bottles. With a little hard work and innovation, Justin was able to create a unique, customized bar area that keeps his wine, beer, and soda cold. Rafael Jannuzzi was one of the first entries and we’re impressed at how good these units look in his home. 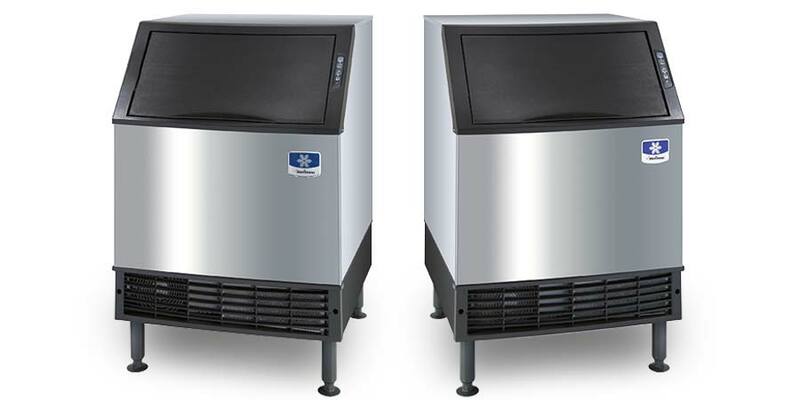 He purchased the EdgeStar 103 Can and 5 Bottle Ultra Low Temperature Beverage Cooler and EdgeStar 34 Bottle Free Standing Dual Zone Wine Cooler which he placed inside his staircase. 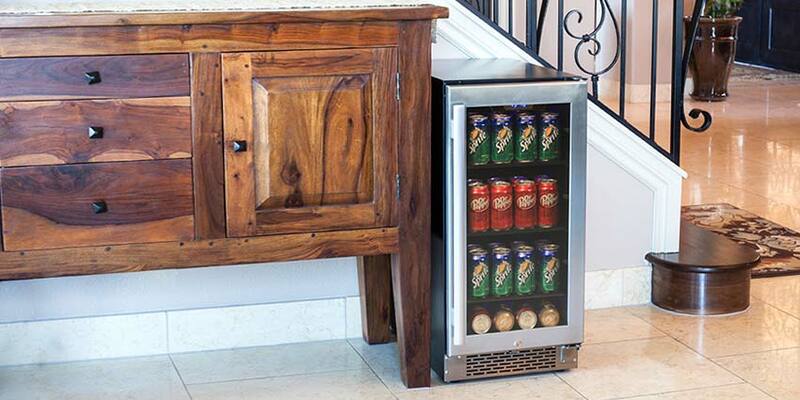 A beverage refrigerator and wine cooler add luxury and style to the space. The sleek exterior which includes a stainless steel trim and glass door perfectly complements the modern décor. Since these are freestanding units, Rafael placed them inside the cabinetry carefully leaving 2-3 inches of space on the sides and top and 3-5 inches in the back. This is essential for the unit to cool properly. Rafael did a great job utilizing the space and properly installing the beverage refrigerator. Nancy Williams replaced a trash compactor with the EdgeStar 80 Can Built-In Beverage Cooler. Trash compactors are slimmer than regular cabinets, which can make the space harder to use. But Nancy purchased our slim 15” beverage refrigerator to transform it into a useful and functional space that would give her quick access to her favorite drinks. Nancy’s favorite feature is the soft blue LED light that illuminates all of the drink options. Since it’s a built in unit, it sits flush with her cabinetry giving it a seamless finish. We love the way Nancy integrated the beverage refrigerator into her kitchen. Thanks to everyone who entered and congratulations to the winners! We hope their photos inspire and show you how a beverage refrigerator can transform your space and be a useful addition to any room. Be sure to look out for more giveaways and contests. GIVEAWAY: Send us your beverage cooler pictures to win a $100 gift card!